If you are searching for Destin beach wedding packages, contact Royal Beach Weddings. We offer our clients a variety of different options to choose from to make there wedding dreams come true. Affordable Florida Beach Wedding Packages! Beach Access fees may apply for some locations. County and State Park Beach fees can range from $130 - $250+ depending on season of the year and quality of location. If you'd like to have the simplest of ceremonies, or just need an experienced ordained minister to perform your wedding ceremony, our Destin Area Ministers would be honored to serve you! We know that Great wedding portraits are so valuable. That's why We deliver professional portraits to each couple we serve. 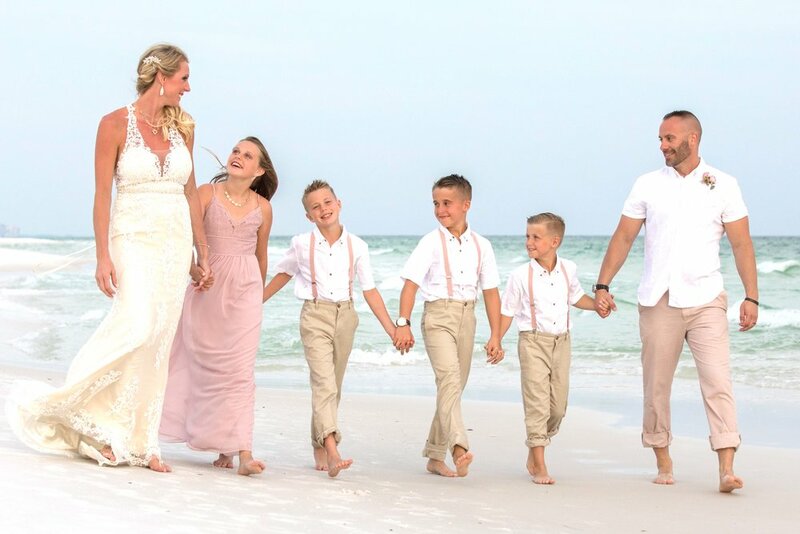 If you'd like to have a simple ceremony and have a professional photographer capture special moments, bridal party, and family portraits this beach wedding package is truly great value! Beach Access fees may apply for some locations. County and State Park Beach fees can range from $200 - $425+ depending on season of the year and quality of location. The Royal Breeze Package is a favorite among smaller traveling families. It provides the essential elements for a fun and elegant beach wedding. You can have your own photographer or we can provide a professional photographer to capture your treasured moments! This Metal Arbor can be used as an alternate to the Bamboo Arbor (It Can also be substituted into any package listed on our website. Beach Access fees may apply for some locations. County and State Park Beach fees can range from $325 - $475+ depending on season of the year and quality of location. ask about our custom floral Beach Wedding setup. Recent Florida Beach Weddings. 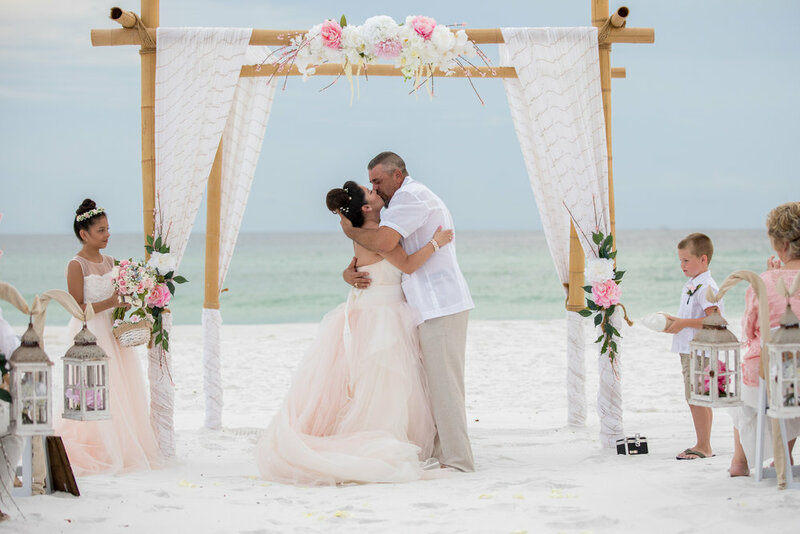 The below listed ceremonies vary from Destin Wedding Minister only services to complete beach wedding packages with photography and beach setups. 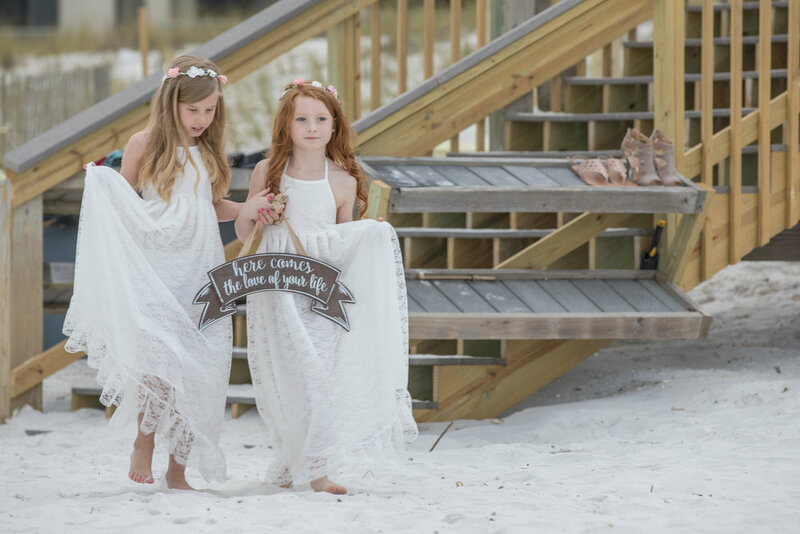 Our Minister and Photographer did a great job on this Destin Beach Wedding ceremony. What an honor to be able to spend some time with this great looking young couple. The RED dresses looked some awesome on the beach. This was a mid summer evening and the Beaches of Destin were in great condition for this wedding ceremony. Some seaweed was present but overall, the sand, surf and sunset were just spectacular. This ceremony included our ministry services and photography services. We helped make another very happy couple. Every couple dreams of having the perfect wedding ceremony to share with their family and friends on the most important day of their lives. Royal Beach Weddings is here to give you exactly that. 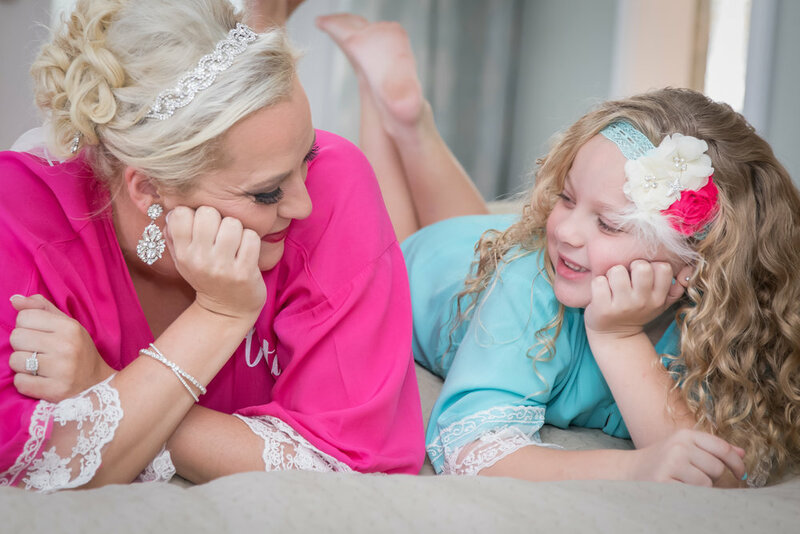 We have performed wedding services in Destin for over 5 years and we feel blessed to have been included in the dreams of every one of our customers. 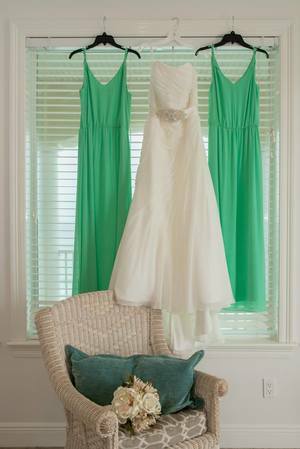 The stunning beaches and scenic emerald green waters of Destin, FL make for the picture-perfect backdrop that your beach wedding ceremony deserves. No matter what service you require, Royal Beach Weddings in Destin, has a beach wedding package that is right for you. We offer many different services for all of our couples, so you can have the wedding of your dreams. We have Minister Only Services for the couples that have their dream day planned out, and are only looking for someone to preside over the ceremony. We also have more complete services that include decorations, seating, sand ceremony, photography, and even a live musician for our couples that need a little more from us. 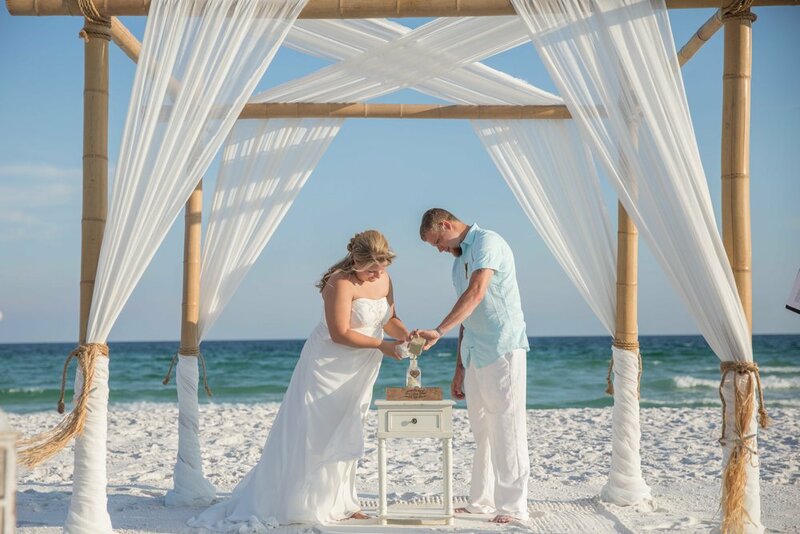 Royal Beach Weddings has customized packages for beach weddings in Destin, that will make your wedding one to remember. We Appreciate our clients feedback! It's a blessing to be able to share in joyous occasions. Below are just some of our over 100 online reviews! So much to say! First - my initial contact with Justy was wonderful. I called, left a message and got a call back within the hour. Each time I talked with Justy, he responded quickly either via telephone or email. Whether I had questions about the event or recommendations for dinner afterward, he was full of great information and honest opinions. The website is full of helpful information - what you see is what you get. He had one picture of an arch that I loved. He explained that he didn't actually have that arch but made a point to get it in time for our wedding. The decorations (floral pieces, chairs, shepherds lanterns, etc) were perfect!! I wanted to modify the ceremony to include our kids. That was no problem. The ceremony he uses is on his website. I was able to modify that to fit our needs and personality. Justy's wife, Julie was our photographer. She was absolutely delightful! Our pictures are wonderful!! Because this is all they do, Justy and Julie worked together so smoothly and ensured that we got some really unique and fun photos! To be honest, I was worried at first because I didn't have a chance to meet Justy and Julie in person before the actual wedding. My groom arrived in time to say hello but I arrived after the guests were seated and Justy was in his place. Julie greeted me and made everything so comfortable and easy. I can't recommend this team highly enough. And the cost was phenomenal too! So much for such a reasonable amount. Wouldn't get married any other way!! We were SO happy that we chose Royal Beach Weddings (Mark) to be our officiant for our wedding! This was something we struggled with finding at first because we wanted to make sure we had some kind of connection to the person who was marrying us on our big day. We felt beyond comfortable after speaking with Justy and going over the logistics and process of their ceremony. Unfortunately, Justy was booked up on our wedding day, but lucky for us we got the honor to have Mark be our officiant. Mark was very responsive throughout the process and also flexible as we decided later on to have him attend the rehearsal. Mark was so personable with everyone leading up to the ceremony and really delivered a great message to us as we got married. It really felt like we had a great connection with him which made our ceremony that much more meaningful. Mark also allowed us to edit our ceremony to allow a 'charge to the parents' the night before the wedding and he fit that in perfectly to the ceremony without a problem! Thank you Mark - and RBW for an unforgettable ceremony! I don't think I can say enough great things about Justy and his team at Royal Beach Weddings! My wedding was everything I DREAMED of and more! Its always a challenge when you are planning a wedding, but especially when you're planning it from a different state, miles and miles away. Choosing Justy, his wife and team for my wedding was the best decision! Throughout the entire process he was extremely friendly, knowledgeable, met all of my needs and responded quickly to all of my questions. When we arrived in Destin, the weather was not looking great for our wedding day. While it always rains in Florida (spotty showers then they disappear) the weathermen and forecast were predicting severe thunderstorms for the entire day of my wedding. Of course, I was a nervous wreck once I heard all of this! My parents contacted Justy late in the evening to talk about the situation and our possible choices. He called the next morning and told us he could switch our ceremony to that evening so we could avoid the impending storms! We moved our wedding up an entire day and everything was PERFECT. No one would have ever known we changed the date at the last minute because it all turned out amazing! I cant thank him enough for being there for us throughout the entire process and truly making it the best day of my life. Thank you Justy and the rest of the team at Royal Beach Weddings! Our wedding with Royal Beach Weddings was absolutely wonderful! They handled every detail and made it so easy and no stress. Our arbor was beautiful and looked perfect on the beach. Our officiant, Mark, did such a great job with the ceremony. Our pictures turned our beautiful. Overall, it was a perfect day! I highly recommend Royal Beach Weddings for your special day! I'm so glad I chose this company to perform my ceremony. Justy and Julie are so sweet and perfessional and were very patient with me through all of my indecisiveness. They were very flexible and helpful when it came to me finalizing dates and items and also with helping me find a place for my reception. The ceremony itself turned out to be more then I could have ever wished for. It was the perfect setup, perfect weather, and Lee was an awesome officiate. My wedding party and I didn't have a rehearsal but everything flowed so perfectly no one would have ever known it. Over all I would definitely recommend this company to make your beach wedding or inland wedding dreams come true. My husband and I traveled to Destin from Mississippi for our destination wedding! A friend assisted us in finding Justy! She called and told me she had talked to minister who "sounded" nice! I later called Justy and was so comfortable talking to him, I knew he would be perfect! He met us at the hotel the evening before the wedding, which he didn't have to do! He talked with us, guided us through a hassle free rehearsal, and promised to meet us the next evening! He performed our ceremony BETTER than we expected or would have planned ourselves! The next day he arrived on time looking very nice in suit that complimented the color scheme we had chosen! The ceremony was beautiful! He did an awesome job! He made us feel like it was not a JOB he was being paid to do! We felt as if he was there FOR us, assisting us in making our sacred commitment before God! We were married on Good Friday! He helped in making it a Great Friday, maybe even the Best Friday ever! Our favorite part was when he prayed with us and for us! I would recommend this minister to newlyweds who wants a minister who puts his heart into their ceremony! Justy provides a service that is incredibly organized and professional. He makes planning ceremonies easy by communicating the process well, and also getting back to you right away if there are any questions. You can tell that he genuinely loves what he does as a minister, which makes such an important day that much more special. I highly recommend Justy! I'm so glad we chose Justy White to officiate our wedding ceremony. We found him sort of at the last moment and he was very quick to respond and accommodating on the script if we wanted to taylor it. He was there on time, very friendly and helped walk my husband and I through the process. I would absolutely recommend Destin Wedding Minister to any bride. Justy with Royal Beach Weddings made everything so very easy! Calling to set everything up was a breeze and after minimal paperwork/payment it was on the books, ready to go. Our officiant, Lee, also served as the master setup/breakdown crew. I had just spoke with him on the phone when I stepped onto the beach and said, I think that's MY wedding being set up!! Lee made everyone feel so at ease and that everything was completely taken care of. He did an excellent job with the service and even wrote us a sweet note saying thank you for letting me officiate. No, Lee, thank YOU for the most perfect beach wedding I could have imagined!! Justy was just excellent across the board. We had a small ceremony and only needed him to officiate it. He was extremely responsive to all our emails and quick to reply. He was wonderful helping us find the perfect beach location and made great recommendations for our dinner afterwards. The service itself was beautiful! He handled it professionally and spiritually. His words were beautiful, biblical, and brought tears to our eyes. We were so grateful for this experience with him. Highly highly recommend! !